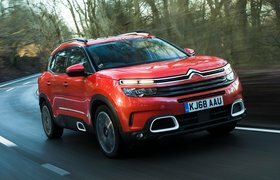 2019 Citroen C5 Aircross Puretech 130 review - price, specs and release date | What Car? Imagine, if you will, a 21st century Goldilocks in the market for a French family SUV. With a growing family to transport, she finds the Peugeot 3008 a touch too small but has no need yet for the Peugeot 5008's seven seats. Fortunately, while Peugeot can't offer her anything that's 'just right', sister brand Citroën is on hand to fill the gap with its five-seat C5 Aircross. Offered in Feel, Flair and Flair Plus trim levels and with two petrol and two diesel engines, there's already lots of choice – and 2020 will bring a plug-in hybrid version to complement our Goldilocks' preference for coconut milk in her porridge. We’ve already sampled the two most powerful engines, it's now time to look at the entry-level 128bhp 1.2-litre Puretech 130 petrol, which is available exclusively with a manual gearbox. It's our favourite engine in the Peugeot 5008, with which the C5 Aircross has much in common beneath the surface. But how well does it suit the smaller, lighter and cheaper Citroën? 128bhp from a petrol engine doesn’t sound much for an SUV, but, like in the 5008, proves more than sufficient. Indeed, the C5's lower weight makes it feel even punchier, pulling well from below 2000rpm and revving freely to the red line. Not that you'll have cause to thrash it all the time; well-chosen gear ratios mean you won't have to swap cogs too regularly. The C5 reaches motorway speeds surprisingly quickly, too, and will sit happily at 70mph without sounding too strained. You do have to work it a little harder to get any sudden bursts of acceleration (overtaking a tractor takes a bit of rev limiter teasing), but it’s nothing you’ll struggle with day to day. Thankfully, changing gears isn't too much of a chore; the gearbox and clutch only require a light touch, albeit with a longer throw to the gearlever than we would like. The engine sounds a little strained at higher revs, but it's generally not too loud or intrusive under normal use. Road noise is also hushed, and although there is wind noise at higher speeds, it's soft and in the background. While the 178bhp 1.6-litre petrol engine offers a bit more poke, it’s only available with an automatic gearbox and only in the top two trim levels, which forces its starting price beyond the smaller engine by over £5000. Similarly, while the diesels are temptingly economical, both the 1.5-litre and 2.0-litre push the price up considerably and you'll need to cover a lot of miles to recoup that initial expenditure. Citroën is proud of the C5's Advanced Comfort package, whose Progressive Hydraulic Cushions on each shock absorber are claimed to create a pillow-soft ride by keeping the suspension controlled at the end of its travel. In practice, though the C5 glides along well and absorbs most bumps and dips easily, it can still get tripped up by potholes and other spikier obstacles. In fact, we found it slightly too soft on more undulating roads, which results in an overly wallowy ride. 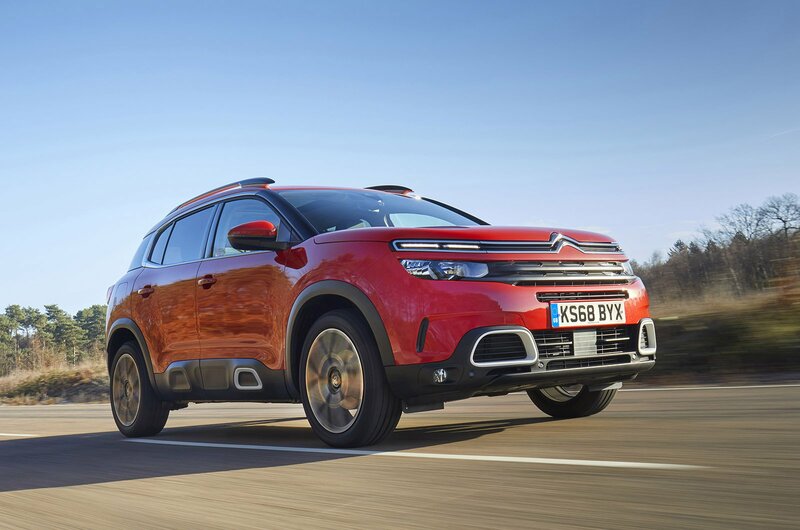 Head toss is significant over turbulent roads, and while Citroën likens this to a ‘flying carpet ride’, it often results in a more boat-in-choppy-waters feel. On motorways, which tend to be on the level, the ride is supreme, though. Light steering that fails to gain weight as you encounter faster roads also adds to the somewhat disjointed feel. Body lean is also considerable when the C5 changes direction, although it finds reasonable grip, even in particularly tight corners. Keen drivers will prefer the 3008, but ultimately the Mazda CX-5 is still the most enjoyable SUV for less than £30,000. 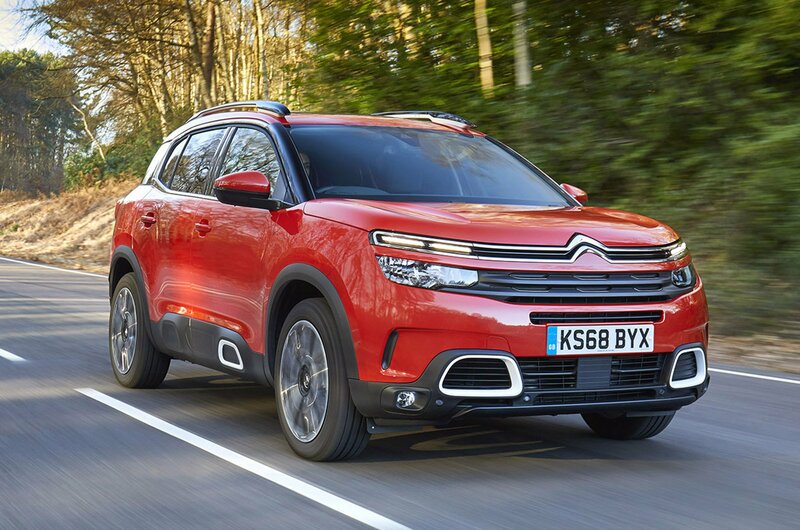 Now we’ve been able to try the right-hand-drive version of the C5 Aircross, we can confirm that the driving position is still neatly set up and offers plenty of adjustment. Step up from Feel to Flair trim and you gain seats that were developed as part of the same Advanced Comfort programme as the suspension, with 'high-density foam' to create ‘lounge-like’ comfort. That might sound a little optimistic, but they certainly didn't disappoint during our time with the car, and they come in a choice of leather-trimmed finishes that please the eye as well as the touch. You'll also appreciate the other soft finishes that include leather-look material across the front of the dashboard and leather accents on the steering wheel and gearlever gaiter. However, while the gloss black fascias around the air vents and centre console help perceived quality, there are still far too many scratchy plastics on display for a car at this price point. One of the C5's more practical features is the modular rear seat that comes as standard across the range. It splits into three equally-sized sections, each of which can recline and slide independently. This allows you to prioritise boot space or rear leg room in any number of permutations. In the rear, the panoramic sunroof (optional on Flair and standard on Flair Plus) proves more of a hindrance than a help. While it lends an airy, comforting feel by flooding the interior with light, it reduces head room to an extent that'll be keenly felt by taller passengers. The infotainment system consists of an 8.0in touchscreen with Apple CarPlay and Android Auto included as standard across the range, with sat-nav thrown in on Flair and Flair Plus. Unfortunately, its design could have been better thought through. While there are touch-sensitive physical buttons to switch between menus, they're mounted on a ridge directly below the screen where they're easily 'pressed' in error as you attempt to steady a touchscreen-prodding left hand. The screen itself is a little tardy in its response, too, and there's no way of adjusting the interior temperature without negotiating with it. The row of physical buttons for controls such as the heated rear screen, is appreciated, though. A 12.3in digital instrument cluster is standard, and it can be customised to show trip, sat-nav or music information clearly and in front of the driver. 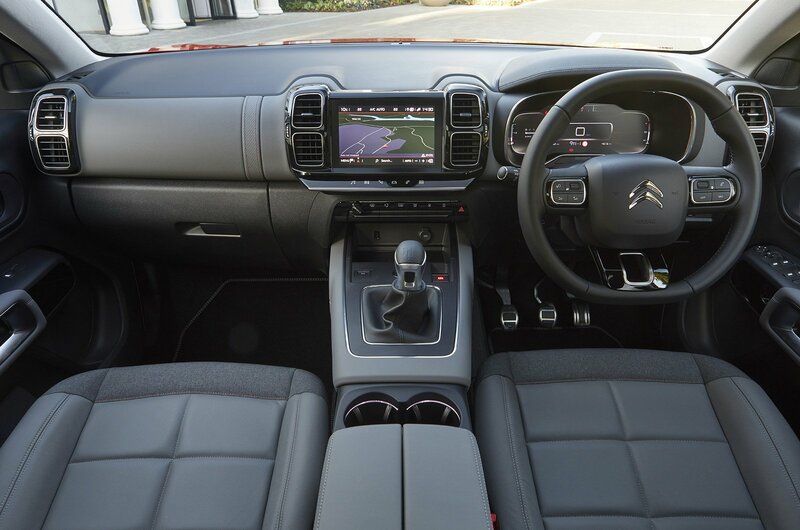 For more information on the interior and full range details, see our full Citroen C5 Aircross review here.